A truly frightening collectible action figure! The Joker from The Dark Knight in all his malevolent glory. Accurately detailed, highly realistic, and very poseable. Includes optional faces and hands, a knife, a machinegun, a rocket launcher, and more. This truly frightening collectible action figure presents the Joker in all his malevolent glory, as seen in The Dark Knight. 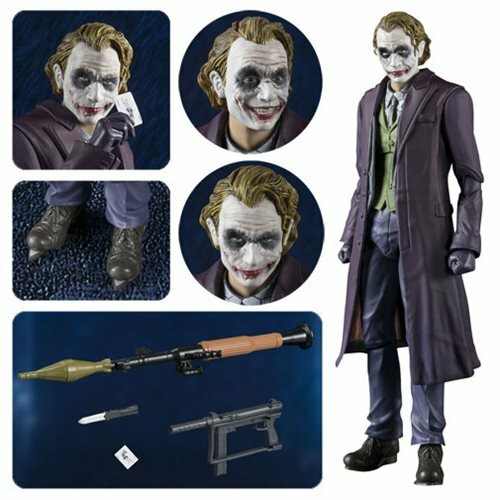 Accurately detailed, highly realistic, and very poseable, the Batman: The Dark Knight Joker SH Figuarts Action Figure stands about 6 1/10-inches tall and boasts 2 optional faces, 5 optional pairs of hands, a knife, a machinegun, a rocket launcher, and a card accessory. You might want to lock him up at night… just in case. Ages 15 and up.